In the early-seventies I was browsing round a second-hand book shop near the bed-sit where I lived. And there it was, face-forward on a shelf: ‘The L-Shaped Room’ by Lynne Reid Banks. 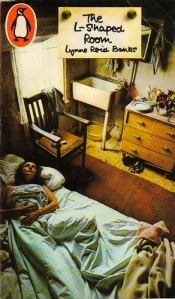 I stared at the picture of the room depicted on the cover, which bore an uncanny resemblance to my grotty bed-sit. Immediately, I identified with the young woman lying on the bed in my room. It was me. And definitely my bed-sit. I’ve never before or since bought a book solely because the picture on the cover drew me to it, made me buy it. Have you ever bought a book for that reason? I read the novel while lying on my bed in that shabby room. It could be described as a coming-of-age novel. The protagonist, Jane Graham, is kicked out by her father when she becomes pregnant. It’s the sixties and the social norms of the time frown on illegitimate pregnancy. She rents a room in a dilapidated house, where she finds herself with people and in circumstances way outside her previous experiences. The skilful writing of the story drew me in and the characters became real to me. By the end of the book Jane has learnt a lot from her experiences and is ready to move on. I remember thinking that this was the sort of novel I wished I could write. But forgetting about the story, what I could identify with most of all was that scene depicted on the front of the book. Years later the image still stirs up powerful feelings and memories of that time in my life. Look! There I am, the young ‘me’, lying on my bed. Having read the book and looking closer I now see her hands cradle her pregnant stomach. I wasn’t pregnant but no matter. Just look at the room. No doubt about it. It’s my grotty bed-sit. That’s the way it was. This entry was posted in Books and tagged book covers, books, housing, social issues, The L-Shaped Room by Jean Davison. Bookmark the permalink. Welcome to WordPress! I don’t think I’ve ever bought a book because of its cover picture. But your post caused me to find the only book by Lynne Reid Banks that I’ve read: An End to Running. And to wonder why that book isn’t listed on her website. I remember enjoying it. Hi Miriam, thank you for joining me on my new blog. I don’t think I’ve read ‘An End to Running’. I’m currently re-reading ‘Dark Quartet’ by Lynne Reid Banks and this got me thinking again about her novel ‘The L-Shaped Room’.